2017 was a tough year for Bitcoin and other cryptocurrencies. With a looming tax filing deadline and in the wake of the first major overhaul to the US tax code in 30 years, it’s time to consider the impact of President Trump’s new tax law on profits (and losses) from Bitcoin and other cryptocurrency investments. Despite Bitcoin’s turbulent few months, most cryptocurrency investors made money in 2017. Now, after unprecedented gains for cryptocurrency investors, tax collectors want their share. 2017 looks to be the year that tax collectors will finally get serious about cryptocurrency earnings, and it’s wise to consult with a lawyer to answer questions about how your cryptocurrency investments will be taxed. If there’s a silver lining to this heightened scrutiny from the IRS, it’s that you will only be taxed on crypto assets that were converted into non-crypto assets like goods and services. Your cryptocurrency earnings currently are not taxable unless you use those earnings to buy something. If you used Bitcoin or other cryptocurrency to buy anything, you should already have a record of those transactions, either on the blockchain or from your wallet provider. You’ll need to convert these transactions to dollars using the value of the cryptocurrency at the time of the transaction. 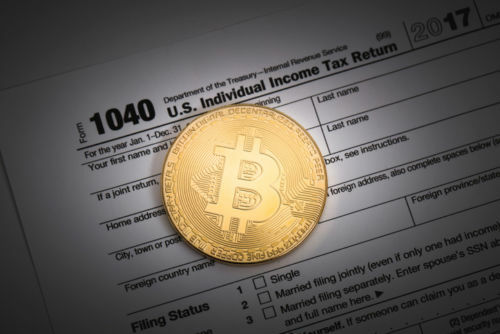 When you report cryptocurrency earnings, you’ll do it on a Schedule D attachment to your Form 1040. As the IRS steps up enforcement of cryptocurrency investors, it’s important that you pay your taxes on any cryptocurrency earnings. The actual reporting of any cryptocurrency earnings will depend on how long you’ve been invested in cryptocurrency. If you held the cryptocurrency for less than a year before purchasing anything with it, the earnings will be treated as a short term capital gain and will be taxed at the same rate as ordinary income. If you were invested in cryptocurrency for more than a year before transacting business with it, the earnings will be treated as a long-term capital gain at a lower rate between 0 and 20%, depending on your tax bracket. Things get more complicated if you were mining cryptocurrency. Cryptocurrency earned through mining is taxed as ordinary income, based on the fair market value of the cryptocurrency at the time it was received. If the mining was a business transaction and you were not doing it for an employer; you will also need to pay self-employment tax. Likewise, cryptocurrency received in exchange for goods or services will be taxed as ordinary income at price of cryptocurrency on the date it was acquired. The new tax bill closed a loophole for cryptocurrency investors by eliminating the “like kind exchange” exemption for Bitcoin investors who switched to other cryptocurrencies such as Ehereum, Litecoin, or other cryptocurrencies. Until now, investors relied on this law to exchange one asset for a similar one without triggering a tax obligation. The IRS made clear that, as of December 31, 2017, only real estate is subject to a 1031 like kind exchange, where an investor swaps one kind of business or investment asset for another. Most swaps are treated as taxable sales, making the 1031 exchange an exception to the normal rule. The closure of this loophole will not go into effect until you file your 2018 taxes in April 2019. As the IRS steps up enforcement of cryptocurrency investors, it’s important that you pay your taxes on any cryptocurrency earnings. If you do not, you’ll be treated as any other tax evader and will receive a deficiency notice that you can either pay or contest. If you have questions about how President Trump’s new tax law will impact your cryptocurrency investments, contact an experienced probate and estate planning attorney at Wolfe Legal Services today. I have more than 23 years experience providing probate and estate planning services to people throughout greater Columbus, including Dublin, Worthington, Westerville, Bexley, Delaware, Upper Arlington, New Albany, Marysville, Hilliard, Delaware, and Newark, and throughout Franklin County, Delaware County, Pickaway County, Fairfield County, Union County, and Licking County. Call or Text (614) 263-5297 any time or complete our secure, confidential, and free online form located on the home page.